Are We Exploiting Our Toddlers To Make Us Laugh? My son left for preschool less than an hour ago, before 8 a.m. And he had already made clear to me several times how unjust, cruel, and soul-crushing his world is. The most unfair request that I made this morning? I am a cruel enough mommy to force my son to wear two shoes, as well as socks, to school when it is freezing cold and raining. For some reason, he did not want to wear two shoes, or no shoes at all; he wanted precisely one shoe on one foot. That’s it. I put both shoes on anyway, and he screamed as if he were being stabbed in the chest. Are we insensitive parents for laughing at our son’s frustration and unhappiness with the world? I don’t think so, but some parents might disagree with our coping technique. I’m sure many of you have seen the viral Tumblr “Reasons My Son Is Crying.” The project comes from a dad, Greg Pembroke, who has recorded many tearful moments in his toddler’s life. The first time that I saw these pictures of Greg’s son Charlie, I laughed but also sighed in relief that other people’s kids cry for so many irrational and strange reasons. I posted it on my Facebook page, and a few readers took offense with the whole project, arguing that it was mean-spirited to document and then post for the entire world your child’s saddest and most pitiful moments. And when I read about the project on the Huffington Post, I saw there were hundreds of parents who agreed with my readers and felt that this dad was exploiting his child and the emotionally vulnerable and tumultuous developmental period of toddlerhood. Five minutes later…. Tantrum forgotten. 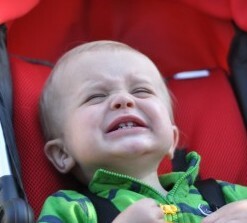 Melinda Wenner Moyer wrote a terrific piece in February about why toddlers have meltdowns. Honestly, I don’t think two days have gone by without rereading the whole thing or consulting it or sending it to a parent with a toddler. This piece explains simply and clearly the difficult realities of the toddler brain. According to Moyer’s research, there are a whole list of factors that contribute to toddlers’ predisposition to tantrums: their lack of language skills, their inability to label emotions, their underdeveloped working memory and self-control, their inability to understand cause-and-effect, their lack of patience, their failure to grasp timing. So does all of this mean that we parents who find regular humor in our child’s emotional struggles are cruel? Should all of us just put away our cameras or our keyboards and just sit and empathize with our screaming bundles of rage? The hardest thing about being the parent of a toddler is that his behavior seems so outrageous and I feel like I may be raising the only toddler in history who has been this difficult. I’m constantly thinking, “This can’t be normal. Really, it can’t.” After a ten minute screaming fit in the middle of a crowded sidewalk because a store was unexpectedly closed. After he uses chairs to climb onto the dining room table and attempt to swing on the chandelier and then has a fit when I won’t let him repeat that feat. For a parent and the child, it’s exhausting in every imaginable way. For me, it truly helps to have a sense of humor about these constant meltdowns. It helps to have someone to laugh with and to know someone understands. I don’t think this is exploitative of the child, even if you choose to share your child’s tantrums with the world. According to Pembroke, he and his family — after their morning show appearances and media celebrity during the past week — have become overwhelmed by unsolicited advice from other parents about how to get his son to stop crying. However, he says that his son — like mine — just has fleeting, intense tantrums and is generally a pretty happy kid. That doesn’t surprise me, and I’m grateful to him and his dad for helping us parents of toddlers not feel so alone. What do you think? Do you think that this sort of media exposure of a child’s most difficult moments is exploitative? Do you feel guilty laughing at your kid’s tantrums? Seriously, I must be a bad person, because I do deal with a lot of the outbursts with laughter, because if I didn’t laugh I may scream. And being the mother of two kids who are only 16 months apart (the oldest not even 4 years old yet), we have a lot of tantrums and meltdowns around here over no much of anything. And yes, like I said I do laugh a lot, because it really does help deal with the craziness. Thanks Jessica for letting me know it isn’t just me! You need to have a HUGE sense of humor to have two kids 16 months apart! How in the world did you ever get through the toddler years? 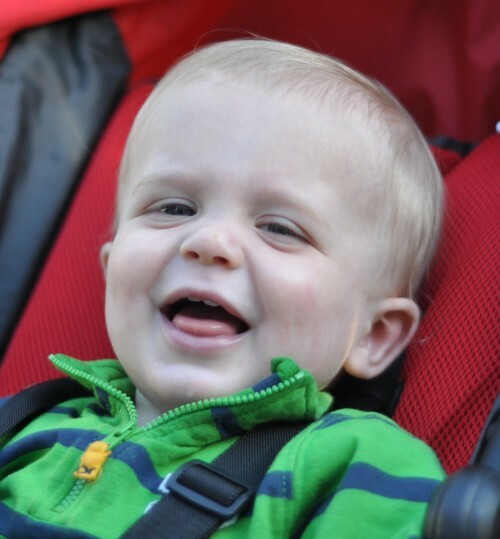 Jessica recently posted…Are We Exploiting Our Toddlers To Make Us Laugh? When I don’t have a sense of humor during or after the outbursts, I become an insensitive mom. I generally avoid laughing in front of them, especially with my 5 year old because that upsets her ( as it would me). My laughter is not intended to be “laughing at them” in a malicious way but laughing at the absurdity of life at that moment. It helps me to stay positive and not turn disappointed and grumpy at myself and the kids. Also, seeing the pictures of someone else’s child crying made me laugh not out of insensitivity to the child but in comraderie with the parent. My thought was, “Oh yes, I, too, experience this. Gee, I should’ve thought of documenting it.” Often, I feel like I am the only parent dragging screaming children home from the park. I know I am not alone, but seeing other’s experiences with this helps me remeber this. It allows me to sigh a bit of relief and keep these moments in perspective. They are just children. I am doing the best I can ( and always trying to get better). Life is absurd, so why not laugh? Thanks, Jessica. Another great piece! Thank you, Wendy! In some ways, I think it sort of makes sense that it’s a dad who did this, don’t you think? Maybe dads are just more likely to see the absurdity in this behavior and understand that there’s not a whole lot you can do about it during the tantrum episode other than try not to freak out yourself about it. Maybe stepping back (and either walking away or even taking a picture) is a whole lot easier for the kid than trying to negotiate and reason with him. Who knows? So, I’m a little bothered by the Tumblr project, but not at all by Jason Good’s post. Lists of reasons why toddlers freak out totally make me feel like I’m not alone. (Some of the best from our week: I wouldn’t let Cee pee on the toilet with the seat up, and I finally wiped a booger off of her finger after she waved it around at me for a full minute.) The reason is the photos. I try to imagine how Cee would react if I popped out a camera while she was falling apart, and I think it would really piss her off. She often tells me to put the camera away when she is in a GOOD mood and wants my undivided attention. It just strikes me as disrespectful. Her discomfort seems ridiculous to me, but it doesn’t to her. I definitely laugh about it later as I give my husband the recap of our day, but I try not to make light of it when she’s in the moment. And if I could take photos or video with a hidden camera, I’d be up for documenting these crazy days of ours to laugh at later. But I know that in her moment of despair (didn’t Melinda Wenner-Moyer quote a researcher who compared it to being betrayed by a spouse? ), seeing me snap a photo of her would make her feel like I didn’t care. I often feel like I’m running out of empathy and patience as it is, and I think that would just make it worse! Yes, I can definitely see that. And it does make me slightly uncomfortable because of the sheer number of photos. We’ve a couple photos of my son’s tantrums, just by accident. I can’t imagine taking out a camera just for the explicit purpose of documenting a meltdown. Probably a lot of it depends on the kid. I’m not a photographer at all. So my son is not used to me taking pictures. If I did, he’d probably get curious and wonder what was going on. Some kids do get too far gone in their tantrums to respond to any form of empathy. So maybe that could be part of his coping response, since the dad loves photography. Among the many things we’re teaching toddlers every hour, every day, is what absurdity, humor, laughter, and introspection mean. We laugh at them for the reason you mentioned — that their behavior is radically inappropriate or mis-matched to the events at hand. How else will they learn that important, complicated human skill, if we don’t teach them? Do you sit with a 2 year old and inform him in adult terms of this phenomenon? No, laughter — kind laughter, is a simpler way. We tried to stop laughing at our kids’ inanity by junior high, but it became increasingly difficult – haha! JK. I think of exploitation as done for monetary gain (generally), by someone who does not love or care for the person being exploited. I’m afraid this is a term that’s being twisted and misused, like many others. No, Mr. Pembroke is not exploiting his son. He’s laughing at something thousands of people find funny. And thousands don’t. So they should simply click away. Yes, I can see how “exploitation” might be the wrong term. (Although he’s been accused of worse in the blogosphere!) I can see both sides of it, but I generally don’t think that a toddler is going to get his “feeling” hurt by having a picture taken during a tantrum. But some kids might find it upsetting. What I find more troubling is the instant condemnation this guy got for doing something like this. I think I agree with Alice. I would love to see posts and writings that help all parents get through the difficult days by telling them that they are not alone and that toddlers cry and rant about the most absurd things! It’s just the documenting of the rants in photographs and then showing it all over the internet that bugs me! I wonder if he now just waits for the next outburst to pull out his camera so he can get another click! My sons too get so frustrated when we pretend to take their photos when they don’t want us to! I know. There are so many of them. His son doesn’t seem to care or notice at this point though. I adored Jason Good’s post. It is essential for me, being the person that I am, to have a sense of humor and laugh during the chaos and tantrums, or else I would cry all day. We all have our own style, and for me, humor and laughter is my coping mechanism. I agree that there are lines that bloggers frequently cross, being disrespectful to their kids, using gratuitous profanity to describe them (this from a swearing mama, so don’t think I am being sanctimonious.) but I am more frequently amused and comforted than offended by these humorous expressions. Great post- super thought provoking! Thought provoking post. I don’t feel the least bit guilty about laughing at my kids’ tantrums—I guess because I only laugh at the truly irrational moments. For example, if my child cries because it’s time to leave grandma’s, I get that and that is not funny at all. If my child cries because she can’t find SpongeBob at Wendy’s, I might have to chuckle a little (in my daughter’s brain, an order of French fries and SpongeBob are the same). I don’t quite understand why parents post tantrums online. If they want to record it and show it to their child someday, I say go for it. But what is the point of posting a video that could haunt their child for the rest of their life. If they’re 16 and want to post their own three-year-old tantrum video, that’s their prerogative. I agree. I do find humor and comfort in the Tumblr. (I feel a sense of relief that my son isn’t the only one who has a lot of tantrums!) I did post one of my son’s tantrums in the post. But I literally think that’s the only one we have on camera. It’s hard to imagine taking that extra step to take a picture when your kid is having a meltdown. You absolutely must have a sense of humor as a parent and that holds true for the toddler or teen years. Laughing at your child will never end well, for either of you, but maintaining good humor throughout is key! Hi, I think that I saw you visited my blog so I came to â€œreturn the favorâ€.I’m attempting to find things to improve my site!I suppose its ok to use some of your ideas! !